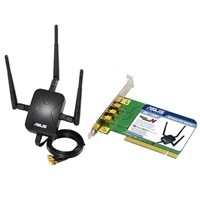 ASUS WL-130N WLAN Card is based on Ralink RT2860 series chipset. ASUS WL-130N Wireless Utilities in English / Traditional Chinese / Simplified Chinese / French / German / Italian/ Japanese / Spanish / Russian / Korean. Note: Include Update driver for Windows 2000/XP/Vista. The Vista user can use the driver included only. Please, give update of driver on http://www.wirelessdriver.com thank you very much..